And the winner is...Stevio! How does 'stevio_1' slip in with 2 secs to spare to scoop the goodies from under my nose!? Shhh: Ryan B told me about sniping application. It's technology at it's best...a redundant server cluster on a high-speed Internet connection which delivers a bid with so little time to react that you can only mess up by limiting your max bid amount. I lost out on a Basquiat art catalogue book from the '80s and another downtown NYC punk art scene book. I was too tightfisted on the Benjamins! Shite! (But there is some justice - I just found that book online again for a quarter of the price ;-) Yes, mate!) I also grieved over a classic '88 adidas leather baseball jacket which went from $50 to $230 overtaking my limit of $180?! Shite! Tougher than Leather, baby! But what have I won? 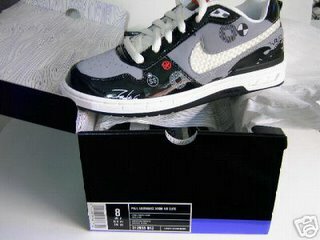 Nike Futura 'P.Rod' (Paul Rodriguez) limited edition (1/500) skateboarding sneakers...prices varied between $150-300. I paid somewhere on the lower end of the scale...and I copped myself a pair of limited adidas (1/4,000) Superstars Lee Quinones 35th anniversary. These were going for $100-320 and I paid somewhere on the lower range. I'm just collecting and 'investing' in the graff artist sneaker collaborations! But who needs eBay for sneaks! I found a site that has the Nike Jordan reissue range. If you have $400-500?! may be you can own a pair of Nike Jordan retros. Me? I paid much less for my Jordan I, II, IIIs back during the early reissue in the '90s, not the umteenth resissue in the '00s. 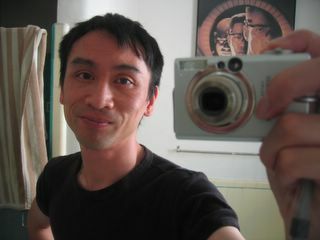 I'm not mad...check this guy out. He's crazy!